You might have noticed that I have a slight obsession with all things floral, romantic and everything sprinkled with ambiance and charm. Like a table set out under the stars with twinkle lights in the trees, or a fireside gathering spot for roasting marshmallows and campfire stories... and maybe even a storybook inspired romantic teepee. I got a wild hair one day and had this dreamy vision in mind... and thought- why not? I decided to set up a fun teepee in the back yard for a little big girls fun - and turned it into more of a retreat spot with just a few things. and a bit of antique lace fabric. I will share a separate post on how to make your own soon. 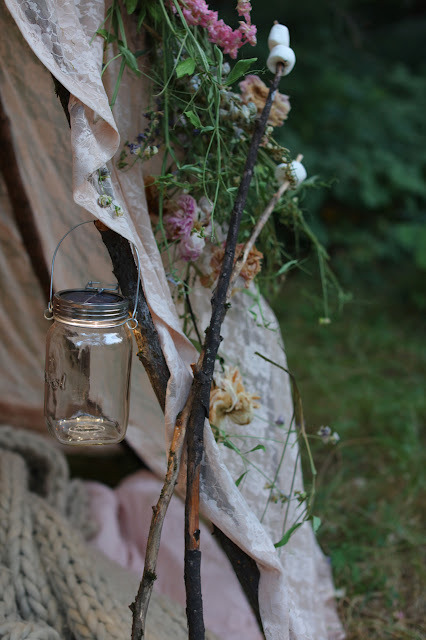 After the tee pee was created, I brought in a few fun things that I found at The Grommet for adding ambiance. If you aren't familiar with The Grommet- it is a fab spot to shop for things from artisans and makers - and I was completely enamored with so many things that I found to create beauty this summer and all year long. Like these solar lanterns. Ahmazing folks. I want to order another dozen of them for lining walkways and hanging in the tree branches. They are vintage inspired charming- and oversized which makes them perfectly for adding flowers or anything else you may want. 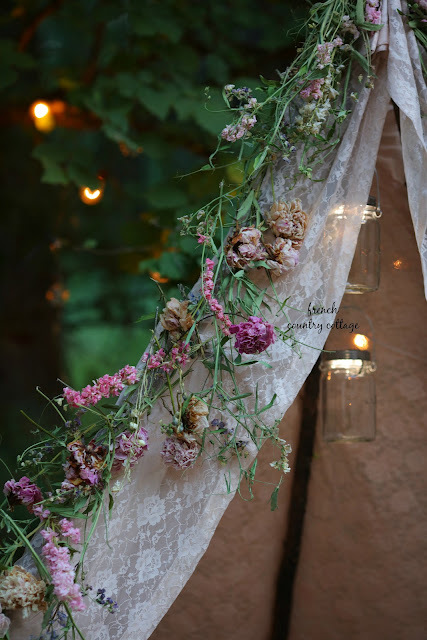 I simply charged these in the sun and then hung them from the branches with string to create a soft warm glow inside the tee pee. 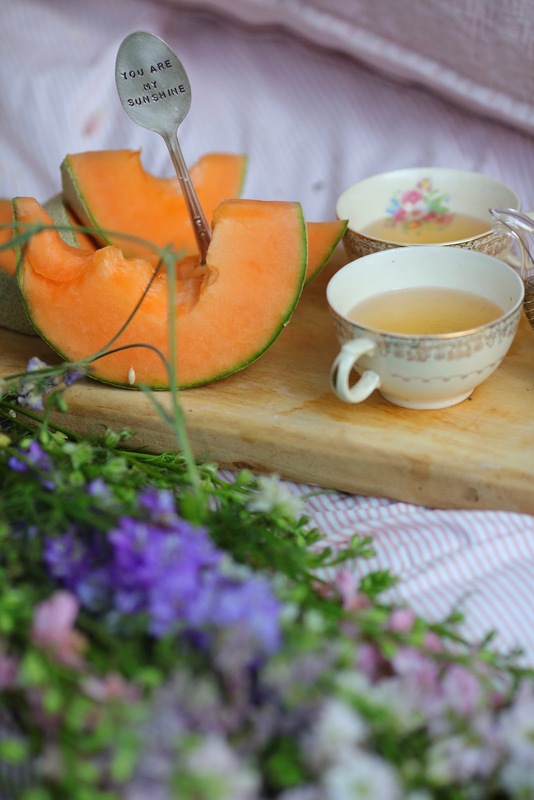 What storybook setting is complete without a charming vintage stamped spoon and a storybook inspired blooming pot of tea? 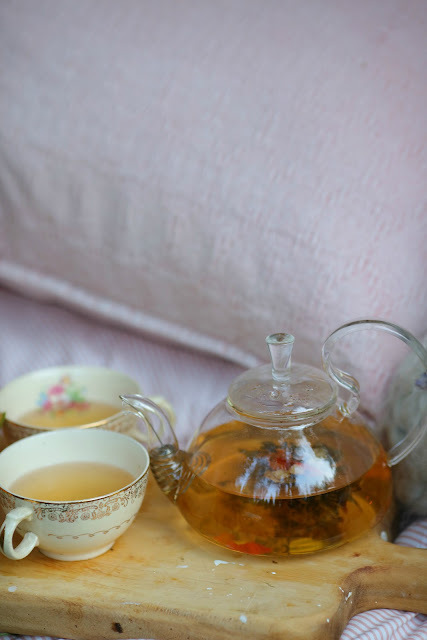 Love the glass teapot and that the tea 'blooms' as it steeps creating a delicious and beautiful tea for sharing with friends. Yes, this tea actually 'blooms' - opening up into a flower as it soaks up the warm water and creates the tea. 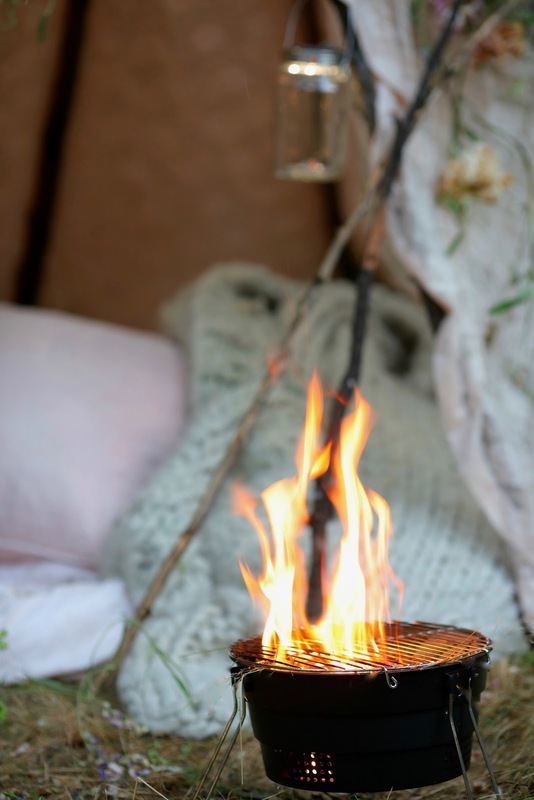 And of course a fun pop up grill which is perfect for roasting a few mallows or just enjoying the ambiance of the flames. Love that this is so versatile too- for the beach, for camping, for a tailgate cook out. It folds up into just a few inches and comes with a bag for toting with you. 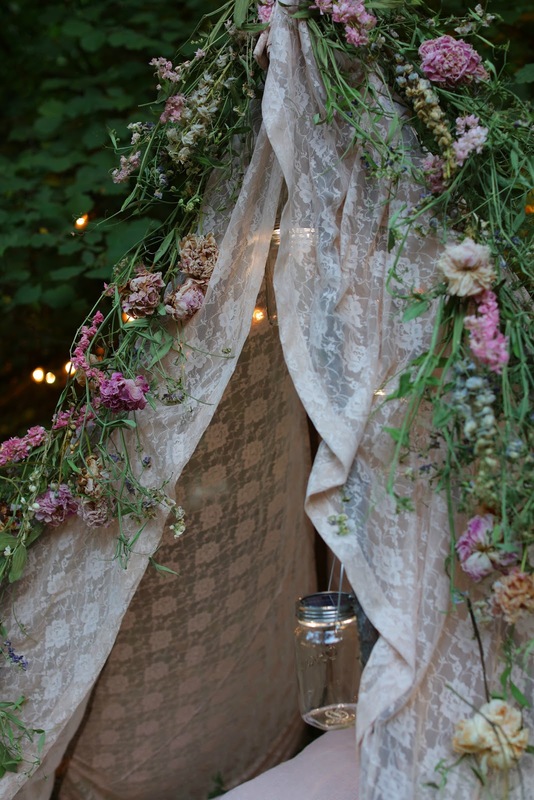 and a fun pom pom paper fringe with loads of old fashioned twinkle lights in the trees for adding a bit more magic. 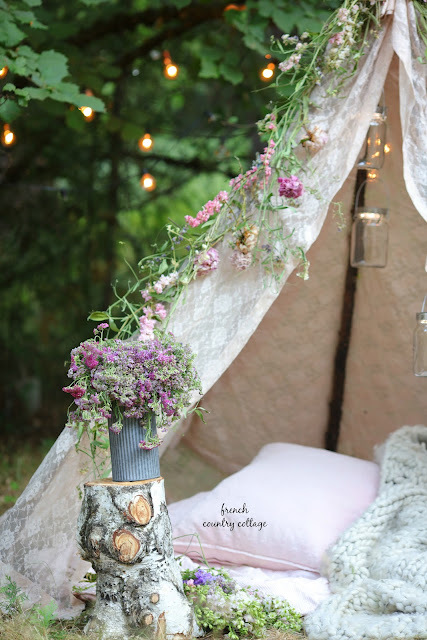 I had a ton of fun creating this inviting spot- and stay tuned for a couple more pieces that just arrived- and also for the post on the diy to creating a romantic teepee and those floral garlands. 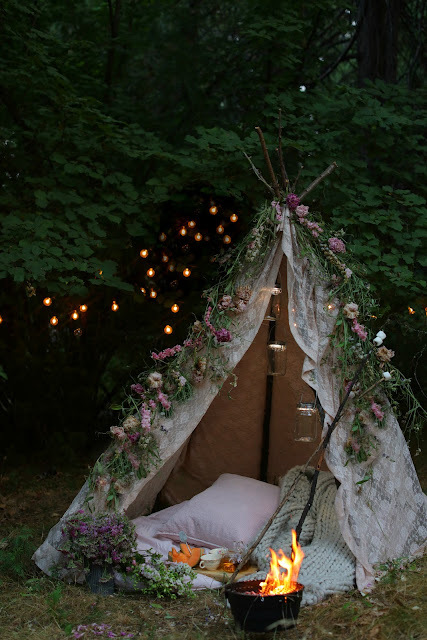 What do you think of this romantic storybook spot? This post was done in collaboration with The Grommet but all opinions, ideas and love of these pieces are my own! What a magical space you created! This brings me back to my childhood days making forts with blankets and scarves from around the house so I could retreat and pretend! You've inspired me to create a grown up tent like yours! Gorgeous! I used to love to make forts too!! SO much fun!! 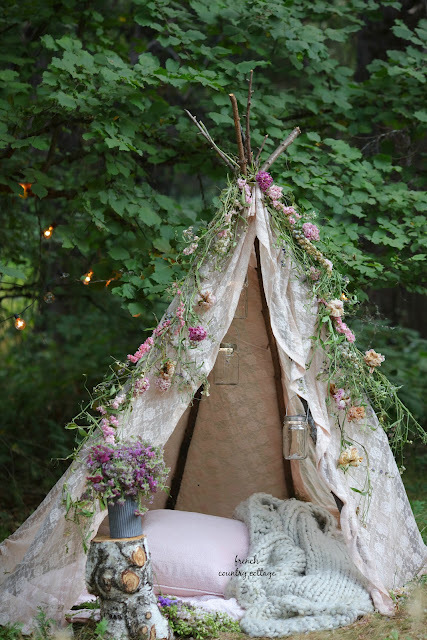 You definitely do need a grown up tent too! What a beautiful retreat! I love that teapot, especially its handle. Just beautiful. You always share such beautiful things. Thank you! Magical indeed! If I were only younger and could bring my friends. Imagine all the fun stories we’d share. Lovely Courtney. Love the Grommet! Yes- so much fun!! And I love The Grommet too- so much good stuff!! Beautiful, love everything about it, what a great place to curl up, sip tea and ready your new book!! I just got notification of when I will receive my copy can not wait!!! That is so exciting!! I hope you like it!! Love your teepee! i would love to have one! ! am awaiting your book and looking forward to read and see all your interesting ideas! My style is so much like yours so I am always happy to see what you have managed to create each week! Happy August! 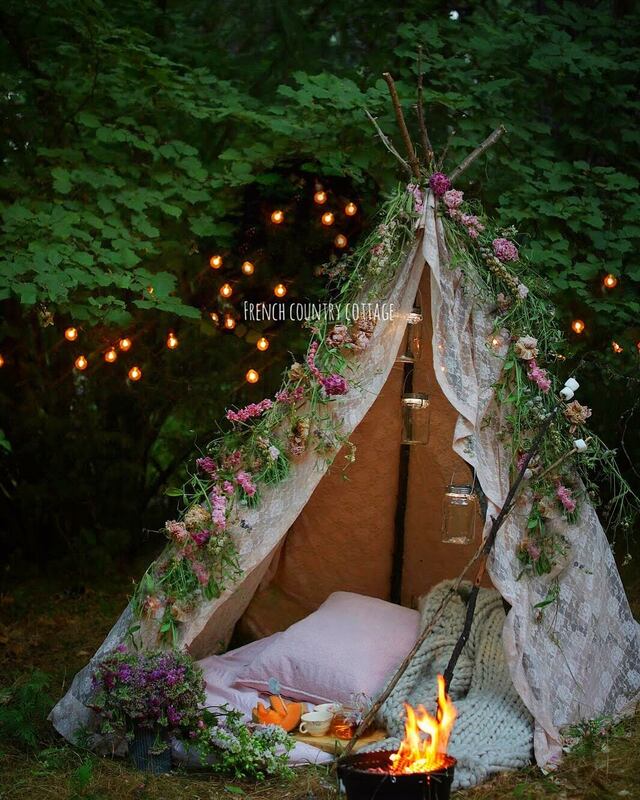 Soooo pretty, and definitely romantic. 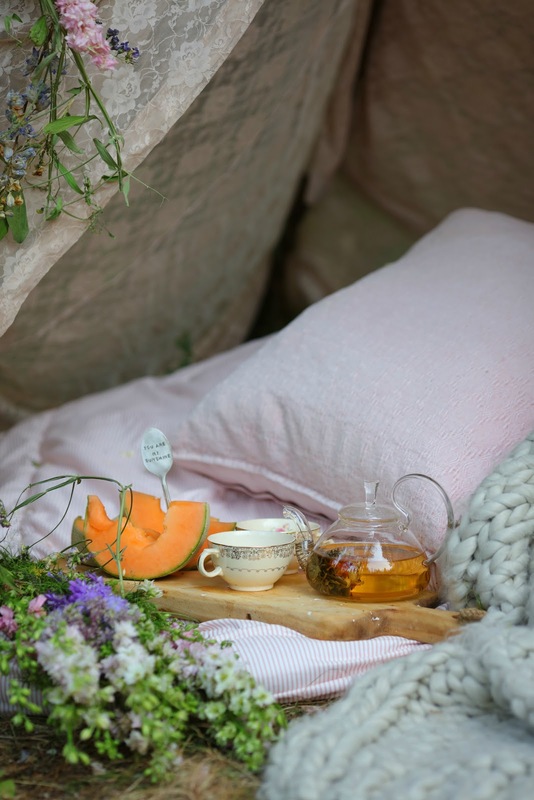 Those Grommet solar lanterns are a great idea and i love the blooming teapot. You did it again, made us all swoon! Love, love it. Can't wait for DYI instructions. I will build it. Looking forward to the teepee building post.